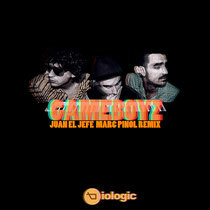 London-based Biologic Records return this April with ‘Juan El Jefe’ by Spanish trio Gameboyz, backed with a Marc Pinol remix. Biologic Records’ roster hosts the likes of Clouded Vision artist Morgan Hammer, and Dame Music / Highgrade artist Attan, and was established by Abstraxion and DC Salas as a platform to release intelligent electronic music across the board. Here the label welcomes Gameboyz, the collective of Luis Vallespin (The Modernphase), Manuel Maidero (Da’ Well) and Carlos Franco (Xar Lee), a trio born in Badajoz, Spain. The EP opens with the original of title track ‘Juan El Jefe’ here, a chuggy, synth-laden workout, employing gritty analogue, arp-style basslines, crunchy distorted drums and hypnotic, heavily delayed and reverberated vocal licks uttering the tracks title, the result is a heady, peak-time number with a raw edge. Closing the release is the Marc Pinol Remix, taking things a little deeper with a rolling subby bassline which ups the energy, while the latter stages see an acidic synth line introduced, further fuelling its peak-time vibe. It's out tomorrow, April 1.